More than 25,000 members of indigenous communities communities are expected to be demonstrating by the end of this weekend to demand President Ivan Duque attend negotiations over chronic state neglect. Colombia’s national indigenous organization ONIC called for solidarity protests across the country after which multiple indigenous peoples began roadside protests and erecting roadblocks. By Saturday morning, at least three roads were blocks and six mass protests were reported by the ONIC and local media. The ONIC said that it hoped that more indigenous peoples will join the national protest. As the national organization is mobilizing its members, more protests and roadblocks could erupt. 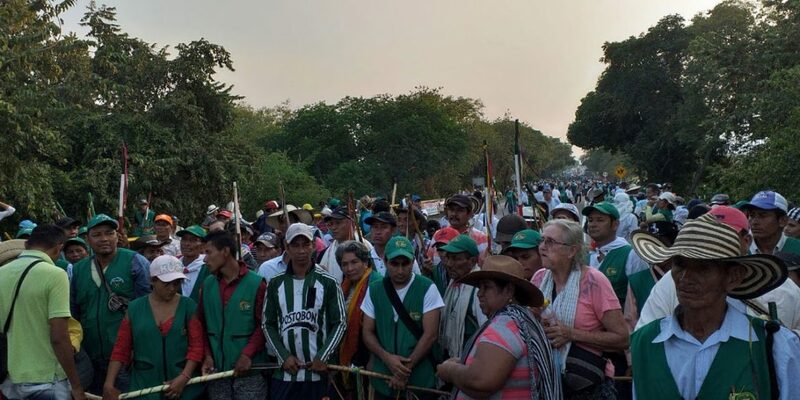 “This protest must grow progressively, and our goal is that by the end of this… weekend, the entire indigenous movement will be mobilized in Colombia,” the ONIC’s chief councilor said in a press release. Duque called indigenous protesters ‘to sanity’, and said roadblocks were an illegitimate means of protest. The initial roadblock of the Pan-American highway connecting Colombia and Ecuador is now well into its third week, and a solution of the conflict between the national government and the indigenous peoples seems further than ever. The protest began with the indigenous community of the Cauca region with the support of the National Indigenous Organization of Colombia, and the support of local afrodescendent and farming communities, as well as from international groups. This week, indigenous groups from Antioquia joined the protest on the Panamerica highway. Talks were suspended on Thursday after the government accused the indigenous community of kidnapping a soldier and carrying out terrorist attacks. The indigenous demanded Defense Minister Guillermo Botero to retract his claim indigenous protests were involved in a wave of guerrilla attacks and said the soldier was legally detained while entering indigenous territory armed. Farmers from four municipalities in Nariño reportedly threatened to also erect road blocks if Duque continues to refuse to talk to the indigenous peoples.